At Cromatic painting , our goal is to not only help you with your House painting needs, but to make the process easy and enjoyable for you. We are a full-service company based in Winnipeg Manitoba . We have a wide range of experience. 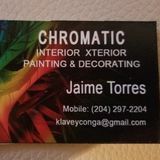 We offer Interior and Exterior Painting, Paint or Stain matching, Pop Corn Ceiling Texture Removal, Speciality Finishes, Gutter Cleaning, Refinish Kitchen Cabinets, Drywall and Plaster repairs, Pressure Washing and our special "Touch Up Service" that keeps your home always looking new.